A generally LOW avalanche danger exists in the core zone of Turnagain Pass, while areas on the periphery continue to trend from a MODERATE danger to a LOW danger. Triggering an old hard slab avalanche 2-4' thick is unlikely, but not out of the question. Areas of most concern are above 2,000' and in shallow snowpack zones such as Girdwood Valley and South of Turnagain Pass toward Johnson Pass and Summit Lake. Pay attention to afternoon warming and give cornices a wide berth. 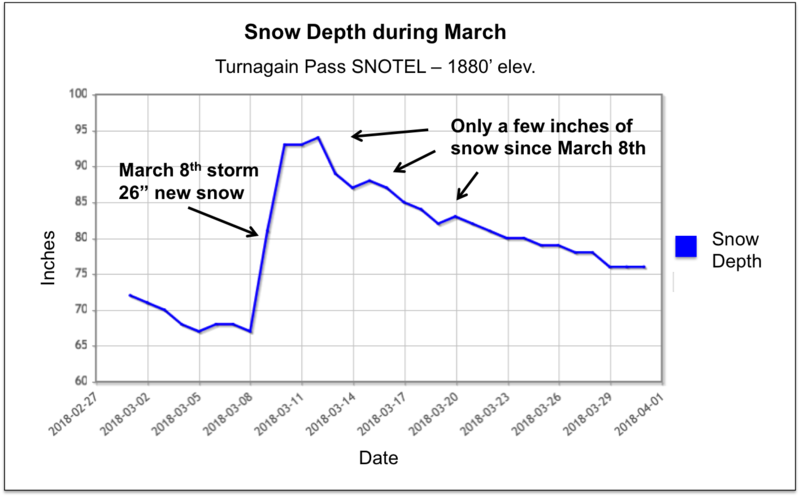 If you are headed South of Turnagain Pass check out the Summit snowpack and avalanche summary. The sunny skies and high pressure that sit over our region will be present again today; clouds may move in tomorrow and a chance for snow exists on Wednesday. Despite the sunshine, chilly and breezy Northerly winds are likely to keep the sun from warming the snow surface too much today, limiting the chance for wet snow avalanches. What this means avalanche-wise is another day with no contributing factors to snowpack instability. We remain in a holding pattern of sorts as the chances for triggering an old hard slab avalanche are becoming more unlikely as time goes on. The current snowpack has a poor structure with many weak layers that sit 2-4' below the surface. These layers are composed of facets and buried surface hoar. The slab on top is hard and varies in thickness due to prior wind effect. The snow surface has been beat up by wind and sun over the past three weeks. Although the weak layers continue to adjust and the slab on top is losing its ability to propagate, we are still concerned someone could find just the wrong spot on just the wrong slope and trigger a dangerous avalanche. Places most suspect are thin snowpack zones such as the Girdwood Valley and the South end of Turnagain Pass towards Johnson Pass, Lynx Creek and Summit Lake. Additionally, North and Easterly slopes in general have a thinner pack making them more suspect. Trigger points in this situation are often in thin areas near rocks or in scoured areas along ridges. As always, practice safe travel habits, expose one person at a time and minimize exposure in avalanche terrain. Although winds are likely to limit surface warming by the sun, keep this on your radar in the afternoon. If the snow heats up enough to become wet and punchy, it's time to move to another aspect. Photos below are from Portage Valley on Saturday. This close up view on the right is a solar aspect of Maynard Mtn on the North side of Portage Lake. This slope is one of the first to have natural wet avalanches on sunny warm days. Note the snowfall during March in the chart below. One large storm right before Spring Break that brought 2-3 feet of snow to the region. Since then, only a few inches has fallen and since March 20th, no snow has fallen. Yesterday sunny skies prevailed again over the region. Ridgetop winds were light (5-10mph) with gusts in the 20's mph from the Northwest. During the day, temperatures warmed to the low 40'sF at sea level and to 30F along ridgetops. Overnight, temperatures have dropped to the teens to the low 20's at sea level and similar along ridgelines. Today, Monday, we can expect clear skies again. Ridgetop winds may bump up slightly from the North to the 10-15mph. Temperatures should climb at sea level to near 40F again today and to near 30F along ridgelines. For Tuesday, clouds may move in ahead of a low-pressure that looks to move into our region from the East on Wednesday. This may also bring a chance for light snowfall on Wednesday. Stay tuned!